This is the toughest thing ever that I’ve had happen in my life," said Levi Weber, a former patient and traumatic brain injury survivor. "I was going to Famous Dave's to meet my dad for his retirement dinner. I got four or five blocks from my house and I was crossing the intersection when a kid made an unprotected left turn and turned into me and basically ran over me," said Levi. June 1, 2017, Levi Weber was involved in a severe motorcycle crash, resulting in 23 broken bones, several strokes and a traumatic brain injury. "What did I feel like when I got the call? I was just sick. Your stomach drops. We didn’t know what his outcome would be cognitively. They didn’t think he was paralyzed but he didn’t really respond for most of 30 days, so we just believed he was going to be okay. We started having people in our church would read to him. So he was hearing either the written word or the Bible or prayers a lot," said Cindy Weber, Levi's mom. Levi was heavily sedated during the first 28 days after the accident. When it came time for recovery, he spent time at the Lincoln Campus before coming to the Omaha Campus. "My first reaction was how my bike is? I was not happy to go from fully functional to having to invalid overnight. I didn’t take that well at all," said Levi. "When he first got here it hurt for Levi to move. He was still weak from the sepsis. Therapy sessions sometimes were getting up out of bed, maybe getting dressed and getting in the wheelchair," said Kayla Hoge, Madonna OT. 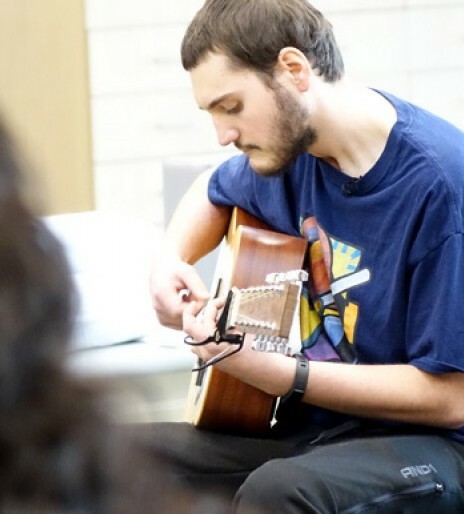 To motivate Levi, staff tapped into his two passions: guitar playing and glass blowing. "Yeah, just having to relearn everything and then having to rely on everybody to do everything for you," said Levi. "We tried to use his hobbies and interest to motivate him. He was really depressed. He didn’t want to be in this situation. It’s a huge life-changing event. I think it was more of us trying to keep that positive outlook to help him continue to push himself," said Kayla. "Just saw each day was rough and we wouldn't see improvements from day-to-day a lot of times I think got really depressing. But that's the beauty of the professionals here because they see the long-term picture," said Cindy. "So with his brain injury it's making him think and sequence through all of those things while working on the coordination in his hands. It's very multi-dimensional, working on lots of things at once," said Kayla. "Just little by little Levi started to make improvements. With lots of medical setbacks," said Cindy. Levi left for home August 31, 2917. He promised his care team he would come back to play guitar for them. He fulfilled the promise March 3, 2018. "He hopes to get a studio up and going, an educational place for his glass blowing. He's back to cooking. He makes an excellent curry. I think the prognosis is great," said Cindy. "It's nice to see how they're doing once they've been gone for awhile and see that they've resumed their normal activities. Yes, it's exciting. It's a lot of fun and it makes it that much more fulfilling for everything that we did while they were here," said Kayla. "Yes, being back here is probably good for us all. A little bit of closure and catharsis and we want to say thanks too,” said Cindy. "At times I still find myself thinking like, 'man how lucky am I that I get to walk and everything because really not only should I not be walking but really I don't think I be alive either," said Levi. Learn about each patient's unique recovery journey with Madonna's traumatic brain injury program.